Monday June 16th 1902 I had churning and baking on hand in the forenoon and in the afternoon got down lot of little things from the garret to put around the house, hung pictures up stairs, and painted furniture. Will took hogs to town in the morning and plowed in afternoon. Tuesday June 17th 1902 I was busy all morning with the regular work and look after chickens. Mother and Aunt Lydia were out in the afternoon. Did evening work went to bed early. 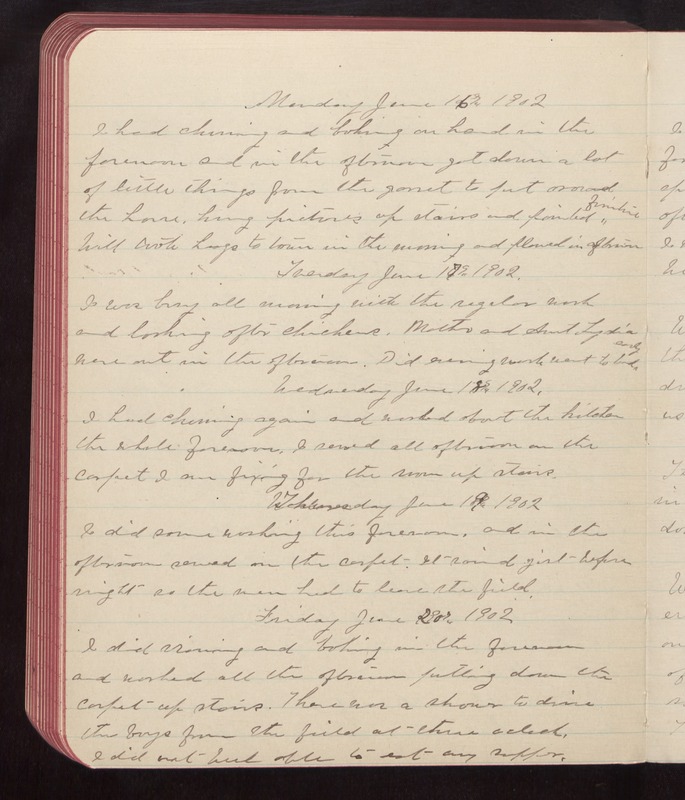 Wednesday June 18th 1902 I had churning again and worked about the kitchen the whole forenoon. I sewed all afternoon on the carpet I am fixing for the room up stairs. Thursday June 19th 1902 I did some washing this forenoon and in the afternoon sewed on the carpet. It rained jist before night so the men had to leave the field. Friday June 20th 1902 I did ironing and baking in the forenoon and worked all the afternoon putting down the carpet up stairs. There was a shower to drive the boys from the field at three oclock I did not feel able to eat any supper.